Stacy Tilton Reviews: Make sure you're brushing often between those holiday meals! Make sure you're brushing often between those holiday meals! I've been using Colgate toothpaste for quite some time now. I switch between one for sensitive teeth and one for whitening. I've found if I use the whitening toothpaste too long my teeth become sensitive and my dentist recommended I just switch between the two if I want to use the whitening toothpaste still. However after trying their new Colgate Essentials Toothpaste with Charcoal I have to say it might be my new favorite. From what I've heard you either like or don't like toothpaste with charcoal. And I guess I lucked out because I really like it. I like the way it feels when I'm brushing, and after I'm finished. Colgate Essentials Toothpaste with Charcoal is great for this time of year too because it has micro polishers to remove stains and impurities for whiter teeth that might be a little dull from wine, coffee and holiday treats. About Colgate Essentials Daily brush + Toothpaste with Charcoal:Daily toothpaste removes stains and impurities for whiter teeth and freshens breath. Toothbrush, with charcoal infused tapered bristles, provides deep and gentle cleaning along the gumline. Daily toothpaste contains micropolishers to safely remove stains. Cooling mint flavor freshens breath. Toothbrush, with charcoal infused tapered bristles, provides deep and gentle cleaning along the gumline. Daily toothpaste contains micro polishers to safely remove stains. Cooling mint flavor freshens breath. Soft toothbrush bristles. The new Colgate® 360°® Advanced Whitening Battery Powered Toothbrush has become another favorite of mine. I've always been a powered toothbrush fan. I just feel like they get my teeth cleaner than using a standard brush. 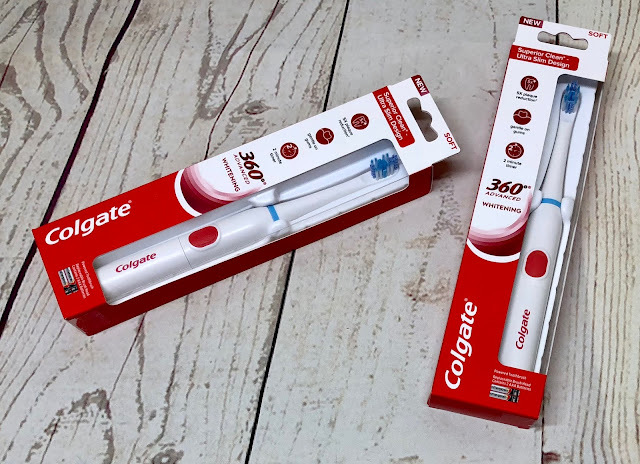 The Colgate 360° Advanced Whitening powered toothbrush with replaceable brush heads provides a superior clean with sonic vibrations for 5X plaque removal. The ultra slim handle design has a 2 minute timer and the compact brush head has spiral bristles and polishing cups to remove surface stains. I definitely always buy a toothpaste for sensitivity which also promises to "restore enamel."